For a limited period, you can download episode one of the Back to the Future iPad game for free. 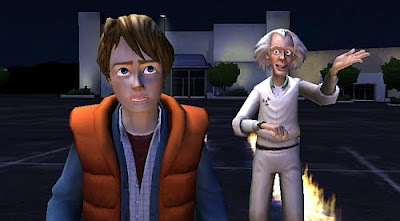 The game is a lovingly crafted tribute to the 1985 movie and its sequels, developed with the help of many of the team from the original movie, including co-writer and producer Bob Gale, and Christopher Lloyd, who played Doc Brown. The game itself is like an interactive film. You control Marty, who can wander around the rooms and streets you travel through. You can talk to characters by tapping them and selecting one of the predetermined phrases, and you can examine objects by tapping them in the background. This interface can be a little frustrating at times. There was one puzzle where I knew what I had to do, but couldn't work out why it wasn't working and that was because I wasn't quite tapping the right place, but there is a good hints system that gives you graded hints until it reveals the answer, so you can push the story along. The graphics and characterisation are great, and the music from the original films helps to build atmosphere. I experienced a couple of bugs playing the game, the most significant of which is that a couple of lines of Marty's dialogue were inaudible. The save game feature would benefit from being more finely grained: you can't control when the game saves, and the chapter chunks are quite large, so the game doesn't suit the kind of dip-in-drop-out play that I usually associate with iPad games. There's enough richness in the story and its presentation, though, that I was happy to be sucked in for longer periods of time. I'm a huge fan of the Back to the Future films, so I loved being able to wander around Hill Valley myself, and appreciated the details they've added which non-fans might not notice. So far, it feels like an extension of the original films, taking the much-loved characters in new directions, while respecting their personalities and shared histories. There are five episodes in total. For now, episode 1 is free and the others are reduced in price. For tips on downloading apps to your iPad, see my book iPad for the Older and Wiser.